Approximately 410,000 active financial services companies are registered in the BVI. 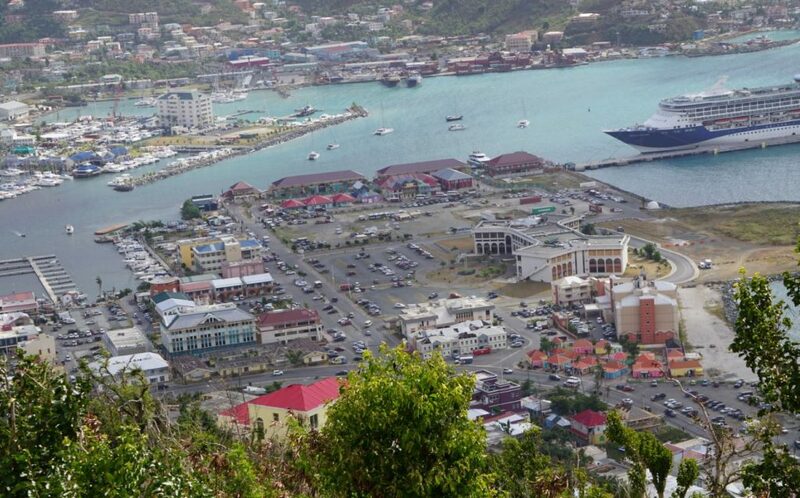 Offshore financial services companies registered in the British Virgin Islands are expected to physically set up office spaces in the territory if they are to continue doing business with/through the BVI. That is the essence of the Economic Substance (Companies and Limited Partnerships) Bill that is currently being debated in the House of Assembly. Offshore companies will be expected to begin opening offices locally once the bill comes into effect on or before December 31 this year. This was mandated by the global superpower group, the European Union (EU). If the BVI fails to comply, the EU will hurl diplomatic sanctions at the territory. According to the bill, companies cannot simply set up an office space in the territory. Those office spaces must also be appropriately staffed to reflect the amount of profit the company is generating in or through the BVI. For instance, if a company typically generates a half-million dollars worth of profits over a certain period, their BVI office must be occupied by the corresponding number of equipment and staff members that can reasonably produce those profits within that period. Notably, there are approximately more than 400,000 financial services companies actively registered in the BVI. Extract from the Economic Substance (Companies and Limited Partnerships) Bill as read in the House of Assembly on December 18, 2018. Legislators from both the government and opposition side of the House have said this economic substance legislation will have unfavourable impacts on the territory’s financial services sector after it has passed. Government minister Myron Walwyn, for example, said getting the respective offshore companies to relocate to the BVI might create challenges in and of itself. Like the eight other legislators that contributed to the debate so far, Walwyn declared his support for the bill. However, none of those legislators are supporting the bill because they agree with it. Rather, they said they support the bill because the EU has twisted their arm, so to speak. “It (the economic substance legislation) is going to create some issues for us — certainly in the short term — that we are going to have to grapple with. But, as we say, the effect of not doing it would be to get blacklisted, which will create other issues for banking and other complications in terms of our commerce activities here in the territory,” Walwyn noted. Opposition Leader Andrew Fahie has described the BVI’s position as one whereby the territory is “damned” if it implements the legislation and damned if they do not. “We have no guarantee when this is passed — even with the amendments — that the EU will say: ‘Well, alright. We accept it fully and you would not be blacklisted. So that’s what I mean when I say damned if you do. And ‘damned if you don’t’ because, if we don’t, we’ll be blacklisted [just the same]” Fahie said. He and the other legislators recognised that yielding to the EU’s demands is the lesser of the two proverbial evils. They have referred to the EU’s ‘Blacklist’ ultimatum as political bullying. The EU is a political and economic union of just fewer than 30 member states that are located primarily in Europe. The EU Blacklist is a compilation of jurisdictions that the group has determined to be non-compliant tax havens. The BVI is currently among other British Overseas Territories and countries that the EU has targeted. Our leaders knew this was coming three years ago. They have left us broke and out of business. Too bad they already got their share from us. Too bad they wasted all our remaining money on their airline and sooooo many other projects that were undertaken without due dilligence, public disclosure and common sense . They snitched all our money and they are laughing all the way to the bank. Look how much they got. What happened? The Offshore business was to good to be true for this little 60-Sq. mile, 25,000 country of a mere tiny 25,000, if so much. It was like having our own Oil wells or Gold Mines. Imagine, twice a year, for the past several years, June and December something like 80-100 millions pouring into our Treasury. More than enough money to run government, build top-of-line schools, give scholarships, fix roads, install traffic lights, build hospitals, clinics, ports facilities and perhaps eliminate Taxes. That kind of money pouring into any economy required/es having people onboard in government with Backgrounds in economics, Financial Planning, Investment strategists etc. Just imagined if we did. Unfortunately we haven’t even been able to Audit our books. Is it any wonder then that we are broke and a bit uncertain about our futures?. Like the song that says: “Who u gonna call”, who are we going to call? Our political folks with heads in the clouds, thinking more about themselves, families and known supporters got carried away; became Jet Setters; possibly the most traveled politicians in the region..and beyond. They forgot about Tourism, that has brought us this far and has been sustaining us since the 1960s. Topics such as Independence and Self-Determination weren’t in our lexicon; England and Uk were words most heard on the international news and BBC than locally. The chickens are finally home to roost. England herself has been warning us about doing like the ants, (storing uf for the unseen/unknown times ahead.). Countries the world over, rely heavily on taxes to run their affairs. We being so tiny and insignificant, (Churchill referred to us as a Bird Sanctuary), the EU apparently wasn’t paying attention; while we flourished. But the world has changed and will always be in a state of change. We are no longer, “Nature’s Little Secrets”. Just look around and make a count of the number of different nationalities in our midst. Pressure is said to burst pipe; and there’s also a book titled, “A whack on the side of the head”. Sometimes that is what it takes to be awakened. May we be awakened normally; without those extremes happening. Does the government have an implementation plan? Does the government have any kind of plan? ……of the end. The highly touted “pillar” of the BVI economy is crumbling faster than a newly paved BVI road. The end is near, very near. Is not the end man. The thousands of companies which are incorporated can’t physically setup here. The only way this works is if a brick and mortar business or sevetal, sets up and does something siginificant here. BVI ppl liked to behave like they’re David and the world is Golaiath and they’ve bwen winning. Don’t get me wrong, I do love the BVI which is why I pay attention to these issues because it is a special place I was priveliged to grow up in. However the mentality that the BVI is doing everything right and doesn’t need a revolutionary change in the way it does business, that it doesn’t have to sacrifice to become something greater is wrong wrong wrong. The idea that others want to take over the BVI is true because the BVI people have forsaken it. We will lose them if we don’t change our ways and humble ourselves to the fact we are a bunch of tiny islands,and get smart and genuinely take proper help from outside and stop looking for the next bubble market. Here we go again. When will it stop…. Did I read that correctly? Our Ministers are seriously considering requiring 400,000 business to set offices and hire millions of people here in the next week? Have they given any thought to compliance? How are they going to administer this? The administration that doesn’t believe in conducting due diligence on big investments now clearly doesn’t have a clue on how to conduct compliance. Let’s assume that the average business needs to employ 10 people. Then we only need to have office space for 400,000 businesses and their 4,000,000 employees. Do we have the ability to house 4,000,000 people? Do we have the ability to even provide water and electricity to that many people? Imagine if 4,000,000 new arrivals decided to flush their toilets all at the same time. Could our sewer system handle it? Maybe we could redirect the sewer system to empty on the fire burning at our dump. That might possibly put the fire out? The can fly them in on 747s to the new airport right away. That’s what the plan was for all along uh huh, yup, that was the plan. What’s the plan mr Premier/Finance Minster? Do we have to lay off 50% all Government Employees now? Do you have a plan? Oh boi! The EU is tightening screws around the BVI st…..s. It is a poison pill of sorts; the new requirements may cause some registrants to leave or new registrants from coming. These actions may impact the current 60% government revenue stream from financial services. An acute reduction in financial services revenue stream will definitely impact GDP, per capita income, quantity and quality delivery of government services, economic growth and development, quality of life and standard of living, employment, office space rental……..etc. Moreover, how many of the current 410,000 registrations have real physical addresses? Can the real market meet the sudden demand for physical functional office space? Pretty well means the end of personal IBC registrations. No more yacht partnerships. No more family trusts. No more hiding assets from the ex. If Ireland and the Channel Islands are not subject to the same rules, you can kiss the BVI financial services industry good bye. This is not good news. If I am reading this legislation correctly, this will be the death nail for the financial services industry as we know it. 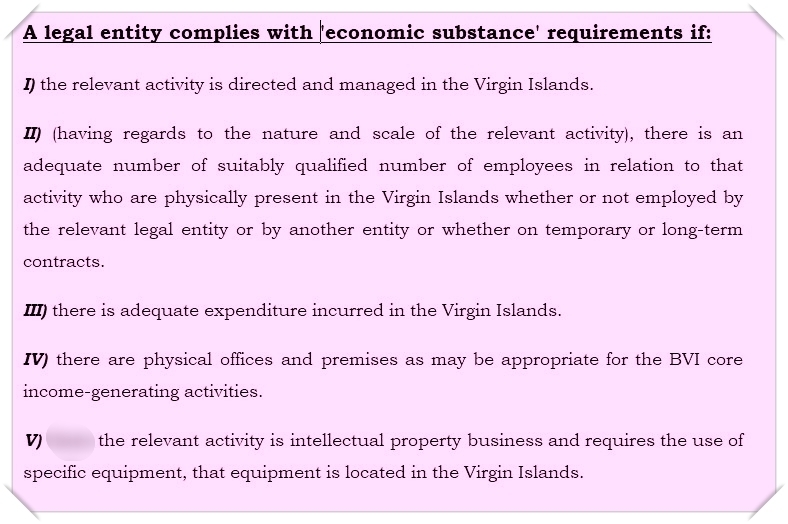 There is no way these companies registered in the BVI will all set up physical offices that are equipped with staff as the law suggest they should…no way. Even if they they could, there is arguably not enough manpower/resources in the BVI for all these companies to set up physical shops. As such, the BVI can kiss the financial services industry goodbye. This train is about to slow down tremendously. It’s highly doubtful that the majority of these businesses will remain; rather, one should expect that they will take their business elsewhere as doing business in the BVI would prove to be too problematic, expensive, and more importantly lacking the anonymity these businesses once enjoyed. This legislation essentially brings transparency to the financial industry. In other words, it turns the lights on, and we all know what happens when the lights come up. The roaches scatter. I expect there will be a sharp drop off in revenues from financial services come next year. The questions will be then, how will the government of the day make up the anticipated tremendous drop off in revenues from this vital sector. Whomever wins the election next year will have quite a challenge on their hands dealing with the fallout of this legislation. The country will need the most capable team of individuals to chart a new course ahead. How the BVI will survive this tyranny.. Why does the BVI have to comply with the EU? What happened to Brexit, we are a British Dependant Territory? Doesn’t that make us part of Brexit?? If you are sanctioned by the EU it doesn’t matter if you are or are not part of it. They will just stop doing business with you. possibly this is even more problematic as a non-EU country as you won’t be afforded the rights of the EU. Yeahhh I’m gonna get a job now. Been without one for months now and still looking……Hooefully jobs will be given to locals and residents. Well you aren’t the only one looking for a job. Our ministers are going to have to fire most of the govt employees unless they have a secret plan up their sleeve. We be busted. They already spent all of reserve money on the airline and other wasted projects. Whatever happened to the people behind the airline? Can we go and get them to give us our money back? What about those people who got paid but didn’t finish the wall? Time to get creative. the EU trying to do,trying for us to do the impossible to make possible. Pls. What happened to the $400,000 Lawyer they hired to work on this this? Was that another “give away” added to the list? Well setting up shop for 400,000 companies is not possible in this short period. So we are going to be black listed!!! Government should’ve saved the money received from the financial sector as it seems rainy days are coming and we have none. We can barely feed and house 30,000 people in the Territory, let alone provide them with reliable power and water. We have a bloated govt (30% more employees than needed to conduct its function), and now we are saying that if you want to form a BVI company, you gotta find office space and hire people to pay them a portion of whatever profit you make in the BVIs? We can’t possibly have more than 12,000 working age people in the territory, a third working for govt, maybe 40-50% in construction, the rest in tourism. So, who is going to do this work? We used to have > 1,000,000 registered BVI companies, now we are down to 400,000. Most of the money in the BVIs comes from these companies. Are we so tired of winning that we don’t need them so much? We’ll be back to a tourism based economy in no time. Low wages, high cost of living. No exactly recovery IMHO. @insane, we never had 1,000,000 active BVI companies. You are not comparing like with like. In fact, the latest statistics show the current total is not far off the all time high. Having said that, this legislation will have a material impact on the BVI and I expect a material decline in number of companies registered here over the next few years, with a direct impact on Government revenues. We will have to adapt and quickly. very long arm and hand of colonial tyranny is still killing across the globe. Yet, many would rather die than divorce, separate and enter into and attain the path of self determination. The latter appears the only path that will guarantee our continued economic stability and growth into the future. If you don’t like “Colonial Tyranny” Go independent. People need to be willing to show how much of a patriit they are. We don’t want to be independent of the UK but we do want to be independent of the hated EU. “Me”, you’ve made an excellent point! Jobs, and more jobs for our people, I hope. If I was the Owner of one of those companies I would be thinking about changing the nature of my “business”. So if you got people who can work remotely, a business that doesnt need an office full of people, and the technological infrastructure to make it happen, why would you have an office? This would kill the BVI, and the EU knows it. The best and only way to deal with those Marxists is a no deal, tell them where to go until the day European affairs are dictated by the BVI HoA. They are such a poisonous bunch, the EU. 400,000 business will go down to 100 You CANNOT force a company to set up shop in the BVI if they do not want to. They will just shut up shop and leave. The BVI CANNOT support all these companies to hire people that don’t exist,business offices that don’t exist The BVI government is signing an agreement that they know they cannot fulfill. Stop with the madness and tell the EU that you cannot and do not want to do this. The EU does not have the right to demand anything.